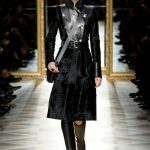 The Fall-Winter 2012-2013 Salvatore Ferragamo collection is clearly inspired by the forties, the end of World War II, when women happily changed military clothing for beautiful dresses. Black is back in vogue, and the new khaki blue is as deep as the night sky. High boots and military trenches, high cuffs on the sleeves, cross-body bags – there is everything that we love so much. 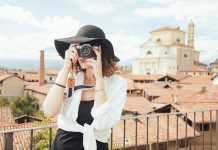 And along with a very feminine incarnation of military style there are romantic blouses, skirts, dresses with wide slits that open collar bones and shoulders, transparent chiffons, embroidery.